Nachos is a Colombian food recipe served all over South America. 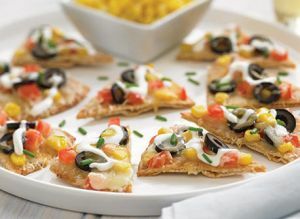 Preheat oven to 100 degrees F.
Spread a thin layer of beans on each chip and place on a heatproof platter or baking pan. Sprinkle on the cheese and top with the chilies. Bake in the oven for about 5 minutes, until the cheese is melted. Serve immediately as is or add the toppings, alone or in a combination.